The team originated as the Boston Braves, based in Boston, Massachusetts, in 1932, under the ownership of Braves Field, home of the Boston Braves baseball team. The following year the club moved to Fenway Park, home of the Boston Red Sox, whereupon owners changed the team's name to the Boston Redskins to suggest a kinship with the Red Sox and to continue utilizing the Braves uniforms. To round out the change, Marshall hired William "Lone Star" Dietz, a part-blood Sioux, as the team's head coach. However, Boston wasn't much of a football town at the time and the team had difficulty drawing fans. The Redskins relocated to Washington, D.C. in 1937. In their early years in Washington, the Redskins shared Griffith Stadium with the Washington Senators baseball team. The Redskins played and won their first game in Washington D.C. on September 16, 1937, a victory against the Giants, 13–3. On December 5, 1937, they earned their first division title in Washington against the Giants, 49–14, for the Eastern Championship. 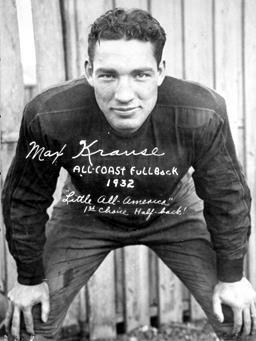 The team then proceeded to win their first league championship, the 1937 NFL Championship Game, on December 12, 1937, against the Chicago Bears, their first year in D.C. The Redskins then met the Bears again in the 1940 NFL Championship Game on December 8, 1940. The result, 73–0 in favor of the Bears, is still the worst one-sided loss in NFL history. The other big loss for the Redskins that season occurred during a coin-tossing ceremony prior to a game against the Giants. After calling the coin toss and shaking hands with the opposing team captain, Turk Edwards attempted to pivot around to head back to his sideline. However, his cleats caught in the grass and his knee gave way, injuring him and bringing his season and career to an unusual end. In what became an early rivalry in the NFL, the Redskins and Bears met two more times in the NFL Championship. The third time was during the 1942 NFL Championship Game on December 13, 1942, where the Redskins won their second championship, 14–6. The final time the two met was the 1943 NFL Championship Game on December 26, 1943, during which the Bears won, 41–21. The most notable accomplishment achieved during the Redskins' 1943 season was Sammy Baugh leading the NFL in passing, punting, and interceptions. The Redskins played in the NFL Championship one more time before a quarter-century drought that did not end until the 1972 season. With former Olympic gold medalist Dudley DeGroot as their new head coach, the Redskins went 8–2 during the 1945 season. One of the most impressive performances came from Sammy Baugh, who had a completion percentage of .703. They ended the season by losing to the Cleveland Rams in the 1945 NFL Championship Game on December 16, 1945, 15–14. The one-point margin of victory came under scrutiny because of a safety that occurred early in the game. In the first quarter, the Redskins had the ball at their own 5-yard line. Dropping back into the end zone, quarterback Sammy Baugh threw to an open receiver, but the ball hit the goal post (which at the time was on the goal line instead of at the back of the end zone) and bounced back to the ground in the end zone. Under the rules at the time, this was ruled as a safety and thus gave the Rams a 2–0 lead. It was that safety that proved to be the margin of victory. Owner Marshall was so mad at the outcome that he became a major force in passing the following major rule change after the season: A forward pass that strikes the goal posts is automatically ruled incomplete. This later became known as the "Baugh/Marshall Rule". The team's early success endeared it to the fans of Washington, D.C. However, after 1945, the Redskins began a slow decline that they did not end until a American Oil Company planned to televise all Redskins games, making Washington the first NFL team to have an entire season of televised games. His next major change came in February 1952, when he hired former Green Bay Packers coach Earl "Curly" Lambeau. But, after two seasons, Marshall fired Lambeau following the Redskins loss in their exhibition opener to the Los Angeles Rams and hired Joe Kuharich. In 1955, Kuharich led the Redskins to their first winning season in ten years and was named both Sporting News Coach of the Year and UPI NFL Coach of the Year. In 1961, the Redskins moved into their new stadium called D.C. Stadium (changed to Robert F. Kennedy Memorial Stadium in 1969). 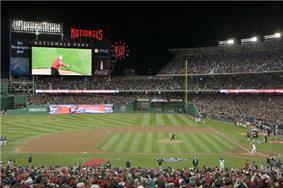 The first game in new D.C. Stadium occurred on October 1, 1961, in front of 37,767 fans. However, the Redskins failed to hold a 21–7 lead and lost to the New York Giants 24–21. That same year, Bill McPeak became the head coach and had a record of 21–46–3 over five seasons. During his tenure, he helped draft future stars: wide receiver Charley Taylor, tight end Jerry Smith, safety Paul Krause, center Len Hauss, and linebacker Chris Hanburger. He also helped pull off two important trades, gaining quarterback Sonny Jurgensen from the Philadelphia Eagles and linebacker Sam Huff from the New York Giants. One reason for the team's struggles was disarray in the front office. Marshall began a mental decline in 1962, and the team's other stockholders found it difficult to make decisions without their boss. Marshall died on August 9, 1969, and Edward Bennett Williams, a minority stockholder who was a Washington resident and one of America's most esteemed attorneys, was chosen to run the franchise while the majority stockholder, Jack Kent Cooke, lived in Los Angeles and ran his basketball team, the Los Angeles Lakers. In 1966 Otto Graham was hired as the new head coach. Graham coached the Redskins between 1966 and 1968, but whatever magic he had as an NFL player disappeared on the sidelines as the team recorded a mark of 17–22–3 during that time period. After resigning the Redskins' post in favor of Vince Lombardi, Graham returned as athletic director of the Coast Guard Academy before retiring at the end of 1984. In 1969, the Redskins hired Vince Lombardi — who gained fame coaching with the Green Bay Packers — to be their new head coach. Lombardi led the team to a 7–5–2 record, their best since 1955, but died of cancer on the eve of the 1970 season. Assistant coach Bill Austin was chosen to replace Lombardi during 1970 and produced a record of 6–8. During most of this unsuccessful period, Marshall continually refused to integrate the team, despite pressure from The Washington Post and the federal government of the United States. On March 24, 1961, Secretary of the Interior Stewart Udall warned Marshall to hire black players or face federal retribution. For the first time in history, the federal government had attempted to desegregate a professional sports team. The Redskins were under the threat of civil rights legal action by the Kennedy administration, which would have prevented a segregated team from playing at the new D.C. Stadium, as it was owned by the U.S. Department of the Interior and thus was federal government property. In 1962, they became the final professional American football franchise to integrate. First, the Redskins drafted Ernie Davis, the first black player to win the Heisman Trophy. They also took black fullback Ron Hatcher in the eighth round, a player from Michigan State who became the first black American football player to sign a contract with the Redskins. But, in mid-December, Marshall announced that on the day of the NFL draft he had traded the rights to Davis to the Cleveland Browns, who wanted Davis to join the league's leading rusher, Jim Brown, in their backfield. Davis was traded to the Browns for running back Bobby Mitchell (who became a wide receiver in Washington) and 1962 first-round draft choice Leroy Jackson. The move was made under unfortunate circumstances – as it turned out that Davis had leukemia, and died without ever playing a down in professional football. The Redskins ended the 1962 season with their best record in five years: 5–7–2. Mitchell led the league with eleven touchdowns, and caught 72 passes and was selected to the Pro Bowl. In time, Mitchell would be joined by black stars like receiver Charley Taylor, running back Larry Brown, defensive back Brig Owens, and guard John Nisby from the Pittsburgh Steelers. 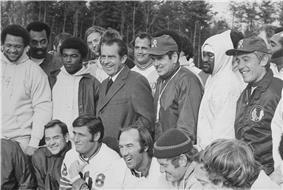 Richard Nixon meeting with the Redskins, November 23, 1971. After the death of Lombardi and Austin's unsuccessful 1970 season, Williams signed former 1971 NFL Coach of the Year Award, the second of his career, winning his first Coach of the Year Award in 1967 as the head coach of the Rams. However, they lost in the Divisional Playoffs to the San Francisco 49ers, 24–20. The following season, the Redskins hosted their first post-season game in Washington since 1942, where they beat the Green Bay Packers 16–3 in the NFC Divisional Playoffs. The Redskins reached the NFC Championship Game, and in a much anticipated match-up against the archrival Dallas Cowboys, the Redskins would not disappoint. The Redskins placekicker Curt Knight kicked an 18-yard field goal in the second quarter to get the scoring underway, then Redskins quarterback Billy Kilmer connected with Redskins wide receiver Charley Taylor on a 15-yard touchdown pass and Washington had a 10–3 lead at halftime. In the fourth quarter, Kilmer again went to Taylor, this time for a 45-yard touchdown. Knight added three more field goals that period and The Over-The-Hill-Gang defense allowed only a second-quarter field goal. The final score was Washington 26, Dallas 3. After defeating the Dallas Cowboys to win the NFC Championship, the Redskins went on to lose to the undefeated Miami Dolphins 14–7 in Super Bowl VII. Redskins running back Larry Brown would be named the 1972 NFL's Most Valuable Player. The Redskins again made the playoffs in 1973, 1974 and 1976, only to lose all three times in the first round. After his Redskins failed to make the playoffs in 1977 despite posting a 9–5 record, Allen was fired and was replaced by new head coach Jack Pardee, a star linebacker under Allen in Los Angeles and Washington. In his first year, his team started 6–0 but then lost 8 of the last 10 games. Then in the offseason, Redskins majority owner Jack Kent Cooke moved from Los Angeles to Virginia and took over the team's day-by-day operations from Edward Bennett Williams. The Redskins chose well during the 1979 NFL Draft, where they drafted future stars Don Warren and Monte Coleman. They opened the 1979 season 6–2 and were 10–5 heading into the season finale at Texas Stadium, against whom a win would assure a playoff spot and a possible NFC East title. Washington led 34–28 with time running out, but quarterback Roger Staubach then led the Cowboys in a fourth-quarter comeback with two touchdown passes. The 35–34 loss knocked the 10–6 Redskins out of playoff contention. Pardee's quick success with the team did not go unnoticed, however, and he was named Associated Press Coach of the Year and UPI NFC Coach of the Year. Pardee's tenure did not last long though, for he was fired after posting a 6–10 record in 1980. He did, however, draft Art Monk in the first-round. On January 13, 1981, owner Jack Kent Cooke signed the offensive coordinator of the San Diego Chargers, Joe Gibbs, as their head coach. Also during the off-season, the Redskins acquired Mark May, Russ Grimm, and Dexter Manley in the 1981 NFL Draft, all of whom became significant contributors to the team for the next few years. After starting the 1981 season 0–5, the Redskins won eight out of their next 11 games and finished the season 8–8. 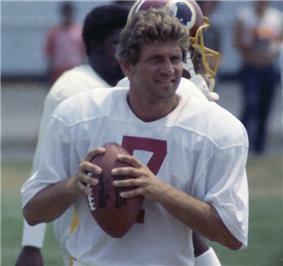 Joe Theismann on Washington training camps in 1983. Starting on September 21, 1982, the NFL faced a 57-day long players' strike, which reduced the 1982 season from a 16-game schedule to a nine-game schedule. Because of the shortened season, the NFL adopted a special 16-team playoff tournament, in which eight teams from each conference were seeded 1–8 based on their regular season records. After the strike was settled, the Redskins dominated, winning six out of the seven remaining games to make the playoffs for the first time since 1976. On January 15, 1983, during the second round of the playoffs against the Minnesota Vikings, John Riggins rushed for a Redskins playoff record 185 yards, leading Washington to a 21–7 win and a place in the NFC Championship Game against Dallas. Jan. 22, 1983, NFC Championship Game at Robert F. Kennedy Memorial Stadium, prior to the game the stadium physically shook as a capacity crowd of 54,000 chanted "We Want Dallas!" The game is best remembered for the quarterback hit by Redskins defensive end Dexter Manley that knocked Cowboys' quarterback Danny White out for the rest of the game and sent him into the locker room shortly before halftime, and Redskins defensive tackle Darryl Grant's interception which he returned for a 10-yard touchdown off one of Cowboys' backup quarterback Gary Hogeboom's passes which was tipped by Dexter Manley to score the decisive points. John Riggins rushed for 140 yards and two touchdowns on 36 carries and the Redskins went on to defeat the Cowboys' by a score of 31–17. The Redskins' first Super Bowl win, and their first NFL Championship in 40 years, was in Super Bowl XVII, where the Redskins defeated the Miami Dolphins 27–17 on January 30, 1983. Riggins provided the game's signature play when, on 4th and inches, with the Redskins down 17–13, the coaches called "70 Chip," a play designed for short yardage. Riggins instead gained 43 yards (39 m) by running through would-be tackler Don McNeal and getting the go-ahead touchdown. The Redskins ended up winning by a 27–17 score with John Riggins winning the Super Bowl MVP. After the 1982 NFL season Redskins placekicker Mark Moseley was the first and only placekicker in NFL history to be named the NFL's Most Valuable Player; Moseley made 20 of 21 field goals attempted in 1982. Redskins head coach Joe Gibbs also won his first NFL Coach of the Year Award in 1982 which was the first of his back to back NFL Coach of the Year Awards, his second coming in the 1983 NFL season. The 1983 season marked the rookie debut of cornerback Darrell Green, selected in the 1983 NFL Draft along with Charles Mann, Green would go on to play his entire 20-year NFL career for the Redskins. On October 1, 1983, the Redskins lost to the Green Bay Packers 48–47 in the highest scoring Monday night football game in history, in which both teams combine for more than 1,000 yards (910 m) of total offense. Then during the regular-season finale on December 17, 1983, Moseley set an NFL scoring record with 161 points while Riggins' total of 144 points was second. This marked the first time since 1951 that the top two scorers in a season played on the same team. They dominated the NFL with a 14-win season which included scoring a then NFL record 541 points, many of which came from Riggins, who scored 24 touchdowns. Redskins quarterback Joe Theismann would also be named the 1983 NFL's Most Valuable Player finishing the season with a career high in both yards passing 3,714 yds., and touchdown passes thrown, 29 Td's while throwing only 11 interceptions. In the postseason, the Redskins beat the Los Angeles Rams 51–7. The next week, Washington beat the San Francisco 49ers 24–21 in the NFC Championship Game. It was their final win of the season because two weeks later, the Raiders beat the Redskins 38–9 in Super Bowl XVIII. The Redskins finished the 1984 season with an 11–5 record, and won the NFC East for the third consecutive season. However, they lost in the first round of the playoffs to the Chicago Bears, 23–19. On November 18, 1985, while playing against the Giants, Theismann broke his leg during a sack by Lawrence Taylor. The compound fracture forced him to retire after a 12-year career, during which he became the Redskins' all-time leader in pass attempts and completions. The Redskins finished 3rd in the NFC East behind the Cowboys and missed the wild card to the Giants by virtue of tiebreakers. The 1986 offseason's major highlight occurred during the 1986 NFL Draft, when the Redskins picked up future Super Bowl MVP Mark Rypien in the sixth round, also the Redskins defensive end Dexter Manley set a franchise single season record when he recorded 18.5 sacks while earning 1st Team All-Pro honors and being selected to the Pro bowl. In 1986, the road to the playoffs was even harder, with the Redskins making the postseason as a wild-card team despite having a regular season record of 12–4. They won the Wild Card playoff against the Rams, and then again in the Divisional playoffs against the Bears. This game was Gibbs 70th career, which made him the winningest head coach in Redskins history. The season ended next week, however, when the Redskins lost to the Giants 17–0 in the NFC Championship game. The 1987 season began with a 24-day players' strike, reducing the 16-game season to 15. The games for weeks 4–6 were won with all replacement players. The Redskins have the distinction of being the only team with no players crossing the picket line. Those three victories are often credited with getting the team into the playoffs and the basis for the 2000 movie The Replacements. The Redskins won their second championship in Super Bowl XXII on January 31, 1988, in San Diego, California. The Redskins routed the Denver Broncos 42–10 after starting the game in a 10–0 deficit, the largest come-from-behind victory in Super Bowl history, which was tied by the New Orleans Saints in Super Bowl XLIV, who trailed the Indianapolis Colts 10–0 after the 1st quarter, and won 31–17. This game is more famous for the stellar performance by quarterback Doug Williams who passed for four touchdowns in the second quarter en route to becoming the first black quarterback to lead his team to a Super Bowl victory while also winning the games Super Bowl MVP award. Rookie running back Timmy Smith had a great performance as well, running for a Super Bowl record 204 yards (187 m). The 1988 Redskins season started off with a boom and the club had a 5–3 record at mid-season, but a 2nd half swoon saw them miss the playoffs with a 7–9 record. The Redskins returned to the playoffs in 1990 as a wild card team, lost in the Divisional playoffs to the 49ers, 28–10. 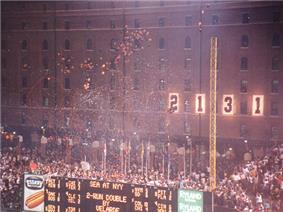 The 1991 season started with a franchise-record 11 straight victories. Also during the season, "The Hogs", under the coaching of Redskins offensive line coach Joe Bugel, allowed a league low and franchise record nine sacks – the third lowest total in NFL history. The 1991 Redskins offense also dominated under the brilliant coaching of offensive minded head football coach Joe Gibbs scoring 485 points which was the most by any team in the 1991 NFL season. The 1991 Redskins defense was also dominant under the coaching of defensive coordinator and guru Richie Petitbon, giving up only 224 total points which was second best of any team in the NFL in 1991, while also not allowing a single point to opponents in 3 of the 16 games played that season. After posting a 14–2 record, the Redskins made and dominated the playoffs, beating the Falcons and Lions by a combined score of 64–17. On January 26, 1992, the Redskins won Super Bowl XXVI by defeating the Buffalo Bills 37–24 with Mark Rypien winning the games Super Bowl MVP award. After the Super Bowl, the Redskins set another franchise record by sending eight players to the Pro Bowl. The 1991 Washington Redskins are widely considered one of the best teams in NFL history. The Redskins success in 1992 culminated in a trip to the playoffs as a wild card team, but they lost in the Divisional playoffs to the 49ers, 20–13. The most impressive feat during the season occurred on October 12, 1992, when Art Monk became the NFL's all-time leading pass receiver against the Denver Broncos on Monday Night Football by catching his 820th career reception. The era ended on March 5, 1993, when Joe Gibbs retired after twelve years of coaching with the Redskins. In what proved to be a temporary retirement, Gibbs pursued an interest in NASCAR by founding Joe Gibbs Racing. After the end of Gibbs' first tenure, the Redskins hired former Redskins player Wayne K. Curry signed a contract that paved the way for the immediate start of construction for the new home of the Redskins (now FedExField). On December 22, 1996, the Redskins played their final game at Robert F. Kennedy Memorial Stadium, a victory over the Dallas Cowboys 37–10, and finished their tenure at the stadium with a 173–102–3 record, including 11–1 in the playoffs. On April 6, 1997, Redskins owner Jack Kent Cooke died of congestive heart failure at the age of 84. In his will, Cooke left the Redskins to the Jack Kent Cooke Foundation, with instructions that the foundation sell the team. His estate, headed by son John Kent Cooke, took over ownership of the Redskins and at his memorial service, John Kent Cooke announced that the new stadium in Landover, Maryland would be named Jack Kent Cooke Stadium. On September 14, 1997, the Redskins played in their new stadium for the first time, and beat the Arizona Cardinals, 19–13 in overtime. On November 23, 1997, they played the New York Giants and the result was a 7–7 tie, the Redskins first tie game since the 1971 season. The result was an 8–7–1 record, and the Redskins missed the playoffs for a fifth season in a row. One bright spot during the season, however, occurred on December 13, 1997, when Darrell Green played in his 217th career game as a Redskin, breaking Monte Coleman's record for games played. The 1998 season started with a seven-game losing streak, and the Redskins finished with a 6–10 record. After two seasons, John Kent Cooke was unable to raise sufficient funds to permanently purchase the Redskins, and on May 25, 1999, Daniel Snyder gained unanimous approval (31–0) from league owners and bought the franchise for $800 million, a deal that was the most expensive team-purchasing deal in sporting history. One of his first acts as team owner occurred on November 21, 1999, when he sold the naming-rights to Jack Kent Cooke Stadium to the highest bidder, Federal Express, who renamed the stadium FedExField. In Snyder's first season as owner, the Redskins went 10–6, including a four-game winning streak early in the season, and made it to the playoffs for the first time in Norv Turner's career (and the first time for the Redskins since 1992) in the final game of the season (on January 2, 2000 against the Dolphins). Running back Stephen Davis rushed for a then club-record 1,405 yards (1,285 m) and quarterback Brad Johnson completed a then club-record 316 passes and threw for more than 4,000 yards (3,700 m) in regular play that season. They then beat the Detroit Lions in the first round of the playoffs, but lost to the Buccaneers, 14–13. The 2000 season started with the selection of future Pro Bowler Chris Samuels and the tumultuous LaVar Arrington in the 2000 NFL Draft and included five consecutive wins in the first half of the season. However, they ended up going 7–6, and on December 4, 2000, Norv Turner was fired as head coach. Terry Robiskie was named interim coach to finish out the season, which ended with an 8–8 record. During the final game of the season on December 24, 2000, Larry Centers became the NFL's all-time leader in catches by a running back with 685 receptions. On January 14, 2002, Snyder hired University of Florida coach Steve Spurrier, the Redskins' fifth new head coach in ten years. They finished with a 7–9 record, their first losing season since 1998. A bittersweet moment during the season occurred on December 29, 2002, when Darrell Green concluded his 20th and final season as the Redskins defeated the Cowboys 20–14 at FedExField. During his twenty seasons, he set a NFL record for consecutive seasons with at least one interception (19) and a Redskins team record for regular season games played (295) and started (258). The Redskins finished the 2003 season with a 5–11 record, their worst since 1994. The one bright note of the season was on December 7, 2003, when defensive end Bruce Smith sacked Giants quarterback Jesse Palmer in the fourth quarter. With his 199th career sack, broke Reggie White's all-time NFL mark (Smith finished the season with 200 career sacks). After two mediocre years, Spurrier resigned after the 2003 season with three years left on his contract. For the 2004 season, Snyder successfully lured former coach Joe Gibbs away from NASCAR to return as head coach and team president. His employment came with a promise of decreased intervention in football operations from Snyder. 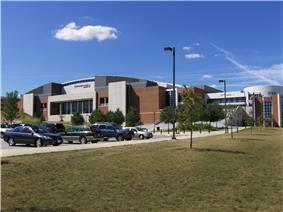 Snyder also expanded FedExField to a league-high capacity of 91,665 seats. Gibbs' return to the franchise did not pay instant dividends as the Redskins finished the 2004 season with a record of 6 wins and 10 losses. Despite an impressive defense, the team struggled offensively. Quarterback Mark Brunell—an off-season acquisition from the Jacksonville Jaguars—struggled in his first season, and was replaced midway through the season by backup Patrick Ramsey. On the other hand, some of Gibbs' other new signings, such as cornerback Shawn Springs and linebacker Marcus Washington, did very well. The Redskins also picked Sean Taylor from University of Miami during the draft in Gibbs' first season. Redskins on the field in 2005. The team won its first three games, including a Monday Night Football victory over Dallas. The Monday Night Football game would go down as one of the greatest comebacks in Redskins history. Trailing 13 to 0 with 3:46 left in the game and facing a 4th down with 15 yards to go at the Dallas 39-yard line, QB Mark Brunell hit WR Santana Moss in the end zone with a pass to cut the lead to 13 to 7 after the PAT. After Dallas would go three and out on their next possession, The Redskins got the ball back at their 30-yard line. On the next play, Mark Brunell hit Santana Moss again and he went untouched into the endzone for their second touchdown, a 70 yard bomb. The Redskins led 14 to 13 and held off Dallas' last drive to preserve the come-from-behind win. The Redskins then fell into a slump, including three straight losses in November, which lessened the chances of the team making the playoffs. However, five consecutive victories at the end of the season allowed Washington to finish the season at 10–6, qualifying for the playoffs as a wild card team. They opened the playoffs on the road against the NFC South champion Tampa Bay Buccaneers on Saturday, January 7, 2006. They won the rematch by a final score of 17–10, after taking an early 14–0 lead, which they later seemed to have squandered until replay evidence showed that an apparent touchdown that would have tied the game was in fact an incomplete pass. In that game, the Redskins broke the record for fewest offensive yards (120) gained in a playoff victory, with one of their two touchdowns being from a defensive run after a fumble recovery. The following weekend, they played the Seattle Seahawks, who had received a first round bye. The Seahawks defeated the Redskins 20–10, ending the Redskins' hopes of reaching their first NFC Championship Game since 1991. Chris Cooley is the former starting tight end for the Redskins. 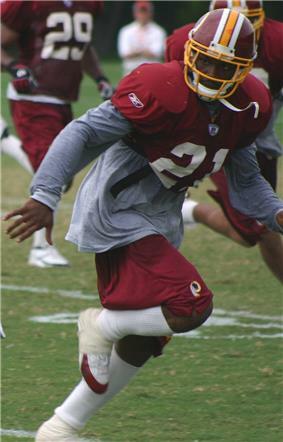 Redskins' safety Sean Taylor during practice. The inconsistency of the offense during the 2005 season resulted in Gibbs hiring offensive coordinator Al Saunders as the Associate Head Coach – Offense. Saunders came from a similar background as Gibbs through being mentored under Don Coryell and was thought to be able to make the offense become more efficient. Saunders would serve as the primary playcaller. Because of this, it was believed that Gibbs would have the role of Head Coach/CEO with the Redskins in 2006 and would largely deal with personnel matters, as well as having more time to focus on special teams and defense, while Saunders would supplement Gibbs with the offense. Gibbs also added former Buffalo Bills defensive coordinator Jerry Gray to his staff as Secondary/Cornerbacks Coach. Gibbs did lose quarterbacks coach Bill Musgrave to the Atlanta Falcons over the summer of 2006. After bringing in new faces Brandon Lloyd, Antwaan Randle El, Adam Archuleta and Andre Carter with lucrative contracts and lucrative bonuses in the 2005–06 offseason, expectations for the Redskins were high. The expectations would in no way be met. The Redskins struggled every week to stay close in games and hold leads. The Redskins lost a close season-opener to the Minnesota Vikings 19–16. However, the season turned for the worse quickly. The Redskins played another primetime game the very next week against the hated rival Dallas Cowboys on Sunday Night football and fell flat on their face, losing 27–10. The Redskins seemed to turn it around after that, routing the Houston Texans 31–15 and quarterback Mark Brunell setting a then-NFL record by completing 22 consecutive passes. The Redskins then defeated the highly regarded Jacksonville Jaguars in overtime 36–30. However, this 2-game win streak would be the high point. The Redskins entered the next week favored over the slumping rival New York Giants and fell again, being demolished 19–3. The Redskins then hosted the winless Tennessee Titans at home, and lost 25–22, allowing Vince Young to win his first career start. After a loss to Indianapolis Colts, the Redskins returned home for a second jab at the Cowboys. The Redskins rallied to tie the game at 19–19. However, the Cowboys were on their way to victory and lined up for a 38-yard field-goal attempt by renowned kicker Mike Vanderjagt. When the kick went up, it was blocked by Troy Vincent and returned by Sean Taylor to the Cowboys 47-yard line as time expired, apparently sending the game to overtime, but a facemask on Dallas allowed newly signed kicker Nick Novak attempt a 49-yard field goal on an untimed down. He squeezed it through the uprights and the Redskins won the game 22–19. The next week, the Redskins traveled to Philadelphia to take on the rival Philadelphia Eagles and fell flat again, falling 27–3. After this, Joe Gibbs replaced Brunell with young quarterback Jason Campbell. The Redskins continued to lose games by close margins and blow late leads, winning only two of its final 7 games, and finishing the season 5–11, last in the NFC East. Redskins' running back Clinton Portis, 2007. 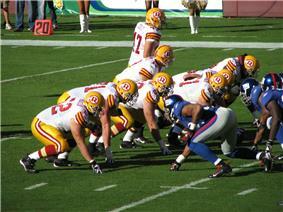 The Redskins gather at the line of scrimmage against the New York Giants. The Redskins began the 2007 season by "winning ugly" starting the season off 2–0. The Redskins kept winning and losing close games, the only exception to this a 34–3 rout of the Detroit Lions. The Redskins continued to win ugly and lose ugly to be 5–3 at the halfway mark. However, the Redskins would begin to collapse. The Washington Redskins lost their next three games to fall to 5–6. On Monday, November 26, 2007, Redskins superstar, Sean Taylor was shot by intruders early in the morning in his Miami home. The next morning, Sean Taylor died from severe blood loss. The heartbreak continued for the Washington Redskins, taking a 9–2 halftime lead against the Buffalo Bills, and eventually a 16–5 lead. However, the Bills cut the lead to 16–14, and got into position with just 8 seconds remaining to win the game. In an attempt to ice the kicker, head coach Joe Gibbs called timeout. However, he attempted to re-ice him, and called timeout again, which drew an unsportsmanlike conduct penalty, reducing the field goal from 51 yards to 36, and Bills kicker Rian Lindell nailed it with ease. Following the heartbreaking loss, the Redskins attended Sean Taylor's funeral two days later, with a game to play on Thursday night against the Chicago Bears. The bad news continued, as quarterback Jason Campbell went down for the season with a knee injury. Following this, unlikely hero and backup quarterback Todd Collins led the Redskins to the victory, keeping their playoff hopes alive. Things continued to turn in the right direction behind Collins, who led the Redskins to a 22–10 victory on Sunday Night Football over the New York Giants and routs of the Minnesota Vikings and rival Dallas Cowboys in the final two weeks to propel the Redskins to 9–7 and the final playoff spot in the NFL playoffs. 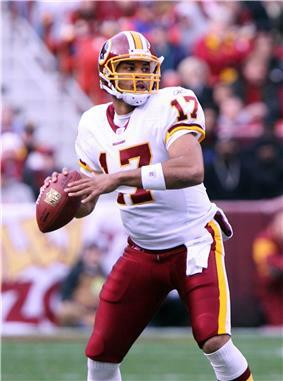 QB Jason Campbell played for the Redskins from 2005–2009, and became a full-time starter in 2008. The season started about as well as it could have, as the Washington Redskins started the season 6–2, with their two losses coming by a combined 11 points to the New York Giants and St. Louis Rams. Furthermore, Redskins star Clinton Portis led the NFL in rushing yards and Jason Campbell was just 40 pass attempts away from breaking Bernie Kosar's record of consecutive passes to start the season without an interception. However, the downturn began on the eve of the 2008 Presidential Election, being routed 23–6 by the Pittsburgh Steelers and Clinton Portis' injuries finally caught up to him. The Redskins continued to struggle, falling all the way to 7–7, with their only win a 3-point victory of the then-2–8 Seattle Seahawks, who were at that point 3–11. Despite this, their fast start ballooned them and thus were still barely breathing, but they needed help. The Washington Redskins upset the Philadelphia Eagles in Week 16, but were eliminated by the Atlanta Falcons due to their 24–17 victory over the Minnesota Vikings that same week. The Redskins lost the final game of the season 27–24 to the San Francisco 49ers, despite having a 17–7 lead at halftime, losing on a Joe Nedney field goal as time expired. The Redskins signed defensive tackle Albert Haynesworth to a 7-year, $100 million contract in the offseason. They also signed cornerback DeAngelo Hall to a 6-year, $54 million contract. Hall had joined the team for the final seven games of the 2008 season after being released by the Oakland Raiders. The Redskins also signed offensive guard Derrick Dockery to a 5-year deal, bringing him back to the team that drafted him in 2003. In the 2009 NFL Draft the Redskins, with the 13th pick overall in the first round, drafted defensive end Brian Orakpo out of Texas. Orakpo was dominant in his senior season (2008) with the Texas Longhorns winning multiple prestigious awards including the Bronko Nagurski Trophy, Ted Hendricks Award, Lombardi Award, and The Bill Willis Trophy, the Redskins hadn't had a pass rushing force like Orakpo since Dexter Manley and Charles Mann donned the burgundy & gold. Orakpo would go on to finish his rookie season with 50 combined tackles, 11 sacks, 1 forced fumble, 2 passes defensed, and 4 run stuffs. Orakpo's highlight game would come on December thirteenth against the Oakland Raiders, Orakpo recorded 6 combined tackles, 4 sacks, and 1 forced fumble earning him the NFC Defensive Player of the Week Award for his efforts, he also was selected to his first Pro Bowl. The Redskins also released two veterans, offensive tackle Jon Jansen and wide receiver/kick returner James Thrash. In addition the Redskins selected University of Kentucky defensive end Jeremy Jarmon in the third round of the supplemental draft. After starting the season 2–3 with all-winless opponents, the Redskins hired former NFL offensive coordinator Sherman Lewis as an offensive consultant. Following a close loss to the Kansas City Chiefs, Lewis was promoted to playcalling duties with coach Jim Zorn was stripped of those duties. Despite huge controversy of the job security of coach Zorn, Vinny Cerrato had stated that Zorn will be the coach of the Redskins for the remainder of the season. However, Zorn and Campbell would outlast Cerrato himself, as he resigned after Week 14. While at the time it was stated in the press that Cerrato resigned, in a January 2013 interview with The Washington Post, Snyder stated he had in fact fired Cerrato for allowing him to hire the unqualified Jim Zorn as the head coach. Three days before the Monday Night Football game against the New York Giants, the Redskins hired former Tampa Bay Buccaneers General Manager Bruce Allen. Despite the fanfare surrounding the Redskins after hiring the son of George Allen, the man who began the winning tradition in Washington, the Redskins were routed 45–12, being swept by the Giants for the third time in four years. The Redskins finished their 2009 season on January 3, 2010 with a 23–20 loss to the San Diego Chargers. The next day, in the early morning, head coach Jim Zorn was fired. They finished with the 2009 season with a 4–12 record. On January 5, 2010, Mike Shanahan agreed to a five-year contract with the Redskins and announced that he would bring his son, Kyle, from Houston to be the team's offensive coordinator, and ex-NFL head coach Jim Haslett for the defensive coordinator position. Other major changes in the coaching staff included retirement of long-time offensive line coach Joe Bugel and defensive coordinator Greg Blache. Jim Haslett made a major change to the defensive scheme, switching from the traditional 4–3 defense to a 3–4 defense, a move which drastically changed the Redskins' plans for defensive personnel. Ahead of free agency, General Manager Bruce Allen released 10 players, including notables such as Antwaan Randle El and Fred Smoot. Early in his tenure at Washington, Mike Shanahan entered into a heated controversy with star defensive lineman Albert Haynesworth. Haynesworth, unhappy with the prospect of playing the position of nose tackle in the new 3–4 defense, did not attend off-season team activities or mandatory minicamp. Shanahan refused to let Haynesworth practice at preseason camp until he passed a fitness test. Haynesworth was unable to pass this test for several weeks, during which the divide between him and Shanahan grew deeper. On December 7, 2010, Haynesworth was suspended for the last four games of the season for conduct detrimental to the team, after he told General Manager Bruce Allen that he refused to speak to Coach Shanahan after Shanahan made Haynesworth inactive in Week 13 for poor practice the week prior. Shanahan said the suspension followed a refusal by Haynesworth to cooperate in a series of ways and not only because of the practice absence. On April 4, 2010, the team acquired Pro Bowl quarterback Donovan McNabb from the division rival Philadelphia Eagles in exchange for a second-round pick in the 2010 draft and a fourth-round pick in 2011. On April 22, 2010, in the 2010 NFL Draft, the team selected All-American Oklahoma Tackle Trent Williams with the 4th overall pick. Also during the 2010 draft, they traded their former starting quarterback Jason Campbell to the Oakland Raiders for a 2012 fourth-round draft pick. The Redskins won their season opener, 13–7, at FedEx Field against the Dallas Cowboys on September 12, 2010. The game was also Coach Shanahan's debut with the team. On October 24, 2010, DeAngelo Hall recorded 4 interceptions in a game against the Chicago Bears at Soldier Field, tying former Redskin Sammy Baugh with a team single-game pass interception record. The Redskins went on to win the game 17–14 and earned Hall a Pro-Bowl spot with his performance. On December 17, only three days before the Redskins traveled to Dallas, Coach Shanahan announced that McNabb would no longer be the starting quarterback, and he was benched in favor of Rex Grossman. McNabb was the second-string quarterback for the Dallas game, and the third-string quarterback for the last two games of the season. Shanahan also reportedly told McNabb that he could not guarantee that McNabb would be with the team the next year. In the game against Dallas, Grossman threw for 322 yards, 4 touchdowns and two 2-pt conversions, yet he turned the ball over three times. It was not enough, however, to overcome the Cowboys, who won 33–30. The Redskins would finish the season with a 6–10 record. At the conclusion of the 2010 season, Mike Shanahan stated that the Redskins were going to revamp their roster in the coming offseason via trades, free agency and the draft. On February 28, after finishing the last three seasons on IR, the Redskins released Clinton Portis, due to the $8 million he was scheduled to make next season. The Redskins then released veteran guard Derrick Dockery and linebacker Andre Carter. On March 3, the Redskins signed O.J Atogwe to a five-year contract. The Redskins then traded troubled Defensive Tackle Albert Haynesworth to The New England Patriots for a 5th round Pick in the 2012 NFL Draft. The Redskins then traded Quarterback Donovan McNabb to The Minnesota Vikings for two 6th round draft picks. The Redskins chose not to re-sign their 2005 first round draft pick Carlos Rogers, who later signed with the San Francisco 49ers. In the 2011 NFL draft, the Redskins traded the 10th overall pick to the Jacksonville Jaguars for the 16th pick, among others, and selected defensive end Ryan Kerrigan from Purdue. Kerrigan won the The Bill Willis Trophy his senior season (2010) while also becoming the Big Ten Conferences all-time leader in forced fumbles with 14, which also tied the Football Bowl Subdivision (FBS) career record of 14 forced fumbles. Kerrigan was also awarded Purdue’s “Pit Bull Award” in 2009, which was given to the player that exemplified and displayed tenacity and tough play. During his rookie season with Washington, Kerrigan would go on to record 63 combined tackles, 7.5 sacks, 4 forced fumbles, 4 passes defensed, 4 run stuffs, and 1 interception that he returned for a 9-yard touchdown in week 1 against the Redskins NFC East division rival New York Giants. During the 2011 NFL season, Redskins outside linebacker Ryan Kerrigan along with fellow Redskins outside linebacker Brian Orakpo earned the nickname KERRAKPO for being the Redskins dynamic pass rushing duo, of which the likes the Redskins had not had since the pass rushing duo of Dexter Manley and Charles Mann during the 1980s. The Washington Redskins also made a habit of trading down and acquiring more, later round picks in the draft; the team entered the draft with 7 picks and ended up making a total of 12 selections. The Redskins selected Jarvis Jenkins, a defensive tackle from Clemson University in the second round; Mike Shanahan addressed this selection in a post-draft interview, saying that Jenkins will transition to a defensive end in the 3–4 defensive scheme that Jim Haslett runs. The Redskins then drafted Leonard Hankerson, a wide receiver from the University of Miami in the third round. 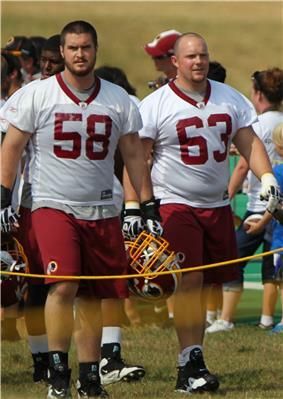 Will Montgomery (right) with back-up, Erik Cook, at Redskins 2011 training camp. In the 3rd preseason game against the Ravens, Jenkins tore his ACL in the 1st quarter, resulting in an end to his promising rookie season. On September 4, 2011 after final roster cuts were made, The Redskins kept 8 out of the 12 picks they drafted, sending Jarvis Jenkins to the IR, and 3 picks to the practice squad, meaning that all 12 draft picks are still in The Redskins' organization. On the 10th Anniversary of the September 11 terrorist attacks which impacted both the cities of New York and Washington D.C., the Redskins won their season opener, 28–14, at FedExField against the New York Giants. The game also featured an interception for a touchdown by 2011 first round draft pick Ryan Kerrigan against quarterback Eli Manning of the Giants. During Week 6, quarterback Rex Grossman was benched in favor of backup John Beck after throwing four interceptions. John Beck was then given the nod by Coach Mike Shanahan to start the following week. Beck started the next three games going 0–3, and was finally benched after Shanahan realized that while Beck's mobility was exceptional and superior to Grossman's, he did not have the range of Grossman. Running Back Tim Hightower played well starting in five of the Redskins' six games, in which he rushed for 321 yards on 84 carries with two total touchdowns, Hightower was placed on injured reserve due to a torn ACL. Afterward, Coach Shanahan began splitting reps between RB Ryan Torain and rookie RB Roy Helu. Torain showed inconsistency throughout the season, despite a good start against the Rams which he rushed for over 100 yards and 1 touchdown. On November 6, 2011 in his first career start, Helu broke the Redskins all-time record for receptions in a game with 14 catches, in a loss against the San Francisco 49ers. On November 27, 2011, Helu rushed for a Redskins rookie-record 108 yards on 23 carries and a touchdown against the Seattle Seahawks' top-ten ranked run defense. He was then named the full-time starter by Coach Shanahan, and responded with three consecutive 100 yard performances. Following his 126 yard performance against the New England Patriots, Helu led all active rookies in rush yards. His streak of three consecutive 100 yard games is the most by any Redskins rookie in franchise history; a record he was unable to extend to four games due to an injury he sustained. During Week 16 against the Vikings rookie RB Evan Royster made his first career start rushing for 132 yards on 19 carries while Helu was nursing an injured knee and toe. After week 13 the Redskins were informed that starting TE Fred Davis and LT Trent Willams would be suspended for the rest of the season for failing consecutive drug tests. On December 27 RB Ryan Torain was released and the Redskins activated WR Aldrick Robinson, their 6th pick, from the practice squad making 11 of the Redskins 2011 draft picks on the 53 man roster (the only one who did not make it was 2nd round pick DE Jarvis Jenkins who was placed on IR during the preseason). The Redskins finished the season at 5–11, which was the worst season recorded for Coach Shanahan. The long awaited arrival of the practice bubble at Redskins Park has been completed in early 2012. This is the first time in Redskins history that they have used a practice bubble. During inclement weather in the past, the team was forced to practice indoors and at a local airport hangar. Former Redskins defensive end, 2010 NFL season, when there was no salary cap. On March 26, 2012, the Redskins and the Dallas Cowboys, who were penalized $10 million in cap space, filed a grievance against NFL and the NFLPA to attempt to overturn their cap space penalties. The joint grievance was dismissed on May 22, 2012. Neil Rackers was also signed to compete with inconsistent starter, Graham Gano. The team re-signed defensive co-captain, London Fletcher, to a five-year deal that expires in two. The Redskins also proceeded to re-sign last season's starters, Tim Hightower, Will Montgomery, Adam Carriker, and Kory Lichtensteiger during the offseason. They decided to not re-sign LaRon Landry, making him the third player who was a first round draft pick of the Washington Redskins to leave the team since the Shanahan administration; the first being Campbell (via trade) and the second being Rogers (via free agency). Landry would later sign a one-year deal with the New York Jets. The Redskins released veteran fullback, Leonard Hankerson, to emerge as a threat for the 2012 season. The most surprising release of the season was starting tight end, Chris Cooley, on August 28, 2012. But to the delight of many fans, Cooley was re-signed by the team in October following an injury to Fred Davis. Running back Alfred Morris was drafted by the Redskins in the sixth round of the 2012 NFL Draft. Following an impressive preseason, he was given the starting job. 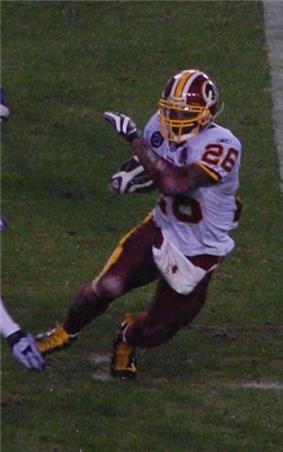 In an important game against the New York Giants on December 3, 2012, Morris became only the second rookie in Redskins history to gain 1,000 rushing yards in a season, ultimately finishing the regular season with 1,613 rushing yards which would be a Redskins single season rushing record, and the second most rushing yards in the league in 2012 only behind Adrian Peterson. Redskins outside linebacker Brian Orakpo tore his left Pectoral muscle in Week 2 against the St louis rams on a play in which he had a sack and forced fumble, it was the same muscle he injured the previous season in the final game against the Philadelphia Eagles. Head coach Mike Shanahan confirmed the next day that Orakpo would have surgery and miss the remainder of the season and be placed on the Injured reserve list. Orakpo's injury highlighted a slew of injuries suffered by the Redskins in 2012. The Redskins would go on to make the 2012–13 NFL playoffs after winning their final seven games of the season en route to winning their division championship for the thirteenth time in franchise history, including defeating the Dallas Cowboys on Thanksgiving Day by a score of 38–31, this marked the first time the Redskins had won at Cowboys Stadium as well as the first time Washington had defeated the Cowboys on Thanksgiving, previously 0–5 to their archrival on Thanksgiving Day. RGIII completed 19 of 27 passes for 304 yards and had 4 touchdown passes and 1 interception on his way to winning the Galloping Gobbler Award issued to the player deemed to have had the best performance in the game. Alfred Morris also had 113 yards rushing on 24 carries and 1 touchdown while the Redskins defense intercepted two passes from Cowboys quarterback Tony Romo and sacked him a total of three times. Then in the last game of the 2012 NFL season the Redskins met the Cowboys in a huge game in prime time on NBC Sunday Night Football at FedEx Field in a matchup that was to decide the winner of the NFC East division with the winner advancing to the playoffs and the loser missing the playoffs. The Redskins would not disappoint the home crowd and put on a show winning the game 28–18 behind a spectacular performance by Redskins rookie running back Alfred Morris who rushed for 200 yards and 3 touchdowns on 33 carries, while the Redskins offensive line only gave up one sack the entire game and held Cowboys defensive stalwart DeMarcus Ware, who was playing with a hurt shoulder and elbow, to 0 sacks and just one assisted tackle. The Redskins defense, led by London Fletcher's 11 total tackles, 2 sacks, and 1 pass defensed, confused and rattled Cowboys quarterback Tony Romo all game long. The Redskins defense had 2 sacks and 3 interceptions in the game with the final one being the most costly, with Dallas trailing 21–18 late in the fourth quarter from the Cowboys own 29-yard line, Romo threw a pass to the flat intended for Cowboys running back DeMarco Murray which was intercepted by Redskins outside linebacker Rob Jackson who was pretending he was going to blitz on the play but at the last second dropped into coverage fooling Tony Romo to make the game changing interception on a play designed by Redskins defensive coordinator Jim Haslett, propelling the Redskins to their first playoff appearance since 2007 and their first NFC East title since 1999. The Redskins would go on to face the Seattle Seahawks in the wild card round of the 2012–2013 NFL playoffs. The Redskins quickly jumped out to a 14–0 lead on the Seahawks in the first quarter but Redskins quarterback Robert Griffin III would tweak a previous knee injury he got against the Baltimore Ravens earlier in the season while scrambling to pick up a first down, he was hit by the Ravens 350 lb. defensive tackle Haloti Ngata causing his knee to bend awkwardly and spraining his LCL. Griffin III would try his best though to lead his team to victory and stayed in the game and played through the pain, although he was not very effective he showed courage up to the moment on a bobbled snap, his knee gave out from underneath him and he tore his LCL and ACL. The loss of RGIII proved to be too much for the Redskins to overcome, and eventually succumbed to the Seahawks 24–14. Griffin III had surgery on January 9, 2013 performed by Dr. James Andrews and both his LCL and ACL were repaired. 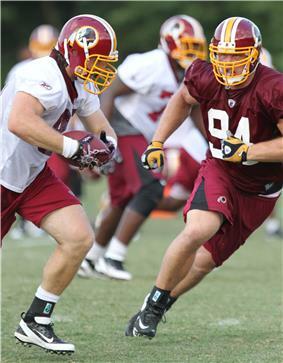 Griffin then vowed to return better than ever for the Redskins 2013 season opener against the Philadelphia Eagles. RFK Stadium or Bowie State University. However, the Redskins eventually chose to relocate their summer training camp to Richmond, Virginia. After winning the NFC East in the previous season, hopes were high for a repeat in 2013. However, these hopes were in vain, as poor play and controversy stirred during the entire year, leading to the disastrous record of 3-13. This was the worst record the Redskins have posted since 1994. Even though most players had a down year compared to last season, Pierre Garcon had his greatest season statistically yet. Garcon eventually broke Art Monk's 29 year old franchise record for catches in a single season. Garcon had 113 catches total, which broke Monk's 106 catches in 1984 by seven. The Washington Redskins fired Shanahan and most of his staff on December 30, 2013. On January 9, 2014, the Redskins hired Jay Gruden as their head coach. Gruden became the eighth head coach of the team since Daniel Snyder purchased the franchise in 1999. Gruden lost his first regular season game as an NFL coach against the Houston Texans 17-6 with the Texans defense controlling the Washington offense for the majority of the game. Gruden would then go on to win his first game as an NFL head coach the following week against the Jacksonville Jaguars 41-10. Redskins primary logo (1972–1981, 1983–present). 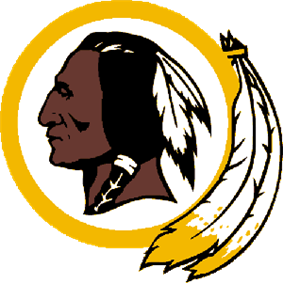 Redskins primary logo (1982). This "tucked feather" version came about as a result of the decals not properly sticking to the helmets at the lower juncture of the feathers and the outer circle. The following year, the decal manufacturer started using a more flexible material, and the team reverted to the "hanging feather" version of the logo. The Washington Redskins' primary colors are burgundy and gold. Continuously from 1961 through 1978, the Redskins wore gold pants with both the burgundy and white jerseys, although details of the jerseys and pants changed a few times during this period. Gold face masks were introduced in 1978 and remain to this day; previous to that they were grey. From the start of the Joe Gibbs era until 2010, the Redskins were one of three NFL teams that primarily wore their white jerseys at home (the others being the Dallas Cowboys and the Miami Dolphins). The tradition of wearing white jerseys over burgundy pants at home, which is considered the "classic" look, was started by Joe Gibbs when he took over as coach in 1981. Gibbs was an assistant for the San Diego Chargers in 1979 and 1980, and the Chargers wore white at home during the tenure of coach Don Coryell in the late 1970s and early 1980s. From 1981–2009, their burgundy jerseys were primarily used when the opposing team decided to wear white at home, which comes mostly against the Dallas Cowboys and occasionally the Philadelphia Eagles, and was normally worn over white pants. It was and is also worn on the road against other teams that like to wear white at home for games occurring early in a particular season. From 1981 through 2000, the Redskins wore their white jerseys over burgundy pants at home almost exclusively. In 1994, as part of a league-wide celebration of the NFL's 75th Anniversary, during certain games the Redskins wore special uniforms which emulated the uniforms worn by the team in its inaugural season as the Washington Redskins, 1937. Both worn over gold pants, the burgundy jerseys featured gold numbers bordered in white and the white jerseys featured burgundy numbers bordered in gold. The most distinctive feature of both colors of the jersey was the patches worn on both sleeves, which were a reproduction of the patches worn on the full-length sleeves of the 1937 jerseys. Worn with these uniforms was a plain burgundy helmet with a gold facemask. In 2001, the Redskins wore burgundy for all home games in the preseason and regular season per a decision by Marty Schottenheimer, their coach for that year. In 2002, the team celebrated the passing of 70 years since its creation as the Boston Braves in 1932, and wore a special home uniform of burgundy jersey over gold pants which roughly resembled the home uniforms used from 1969–1978. The helmets used with this special home uniform during that year were a reproduction of the helmets used by the team from 1965–69. This special home uniform was also worn during one game in 2003. In 2004, when Joe Gibbs became the coach of the Redskins once again, the team switched back to wearing white jerseys at home; in Gibbs's 16 years as head coach, the team never wore burgundy jerseys at home. Their white jerseys have provided three basic color combinations, two of which have been previously alluded to in this article. The last combination consists of both white jerseys and pants. That particular combination surfaced in the first game of the 2003 season, when the team was coached by Steve Spurrier, during a nationally televised game against the New York Jets, which led many sports fans and Redskins faithful alike to point out that they had never seen that particular combination before. That year the Redskins wore it two more times. That look didn't appear again until midway through the 2005 season when the Redskins wore it in a road game against the St. Louis Rams. The Redskins won six straight games, including one in the playoffs against the Tampa Bay Buccaneers, wearing that combination and the local media jokingly pointed out that the reason the Redskins were winning was their use of the white over white combination. In the NFC Divisional Playoff game against the eventual 2005 NFC Champion Seattle Seahawks, the Redskins wore the all-white uniforms, in hopes that they could keep their streak going; however, they lost 20–10. 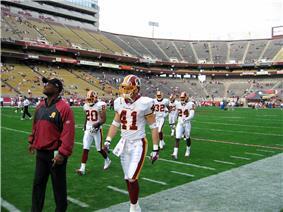 The Redskins continued to wear the white jerseys and white pants into the 2006 preseason. In the 2006 season, the Redskins started wearing black cleats, something that hadn't been done for quite a while. It was a surprise because they wore white cleats during the preseason. They would have to wear that color for the rest of the season, because the NFL usually asks teams to choose either black or white cleats to be worn throughout the season. After the white-over-white period which lasted from the mid/late 2005 season into 2006, the classic uniform of white jerseys over burgundy pants reappeared on November 26, 2006, in a home game against the Carolina Panthers. The decision to return to the classic look may have symbolized a desire by the team to turn a new page on their 2006 season, which had been very lackluster previous to that game, the period of success with the white jerseys over white pants having come to an end the previous season. The move may have also been related to the fact that this home game was the second start and first home start of second-year quarterback Jason Campbell, and that the game and the previous week's game were, in the hopes and perceptions of many Redskins fans, the start of the "Jason Campbell era." The Redskins went on to win that game against Carolina, preserving slim hopes of the team's being able to make it to the 2006 playoffs, although they ultimately missed the playoffs. Redskins 75th anniversary uniform (2007). In celebration of the franchise's 75th anniversary, the Redskins wore a special throwback uniform for the September 23, 2007 home game against the New York Giants. Players wore a white jersey (in keeping with Gibbs's exclusive use of the color, whereas most other NFL throwback jerseys tend to be dark) with 3 burgundy and 2 gold stripes on each sleeve and the 75th anniversary logo on the left chest. The pants were gold, with one white stripe bordered by a burgundy stripe on each side, running down each side. The helmet was gold-colored with a burgundy "R" logo. The helmet and uniform styles (besides the anniversary patch and the position of the upper-most, "TV," numbers) were the same as the ones the franchise used during the 1970–71 seasons. While this throwback uniform was worn during a home game, it was actually the away uniform for 1970–71. (The helmet was discontinued after the 1971 season, while this basic away uniform design, minus the helmet, was used through the 1978 season, as well as during most of the 1969 season.) Vince Lombardi, who coached the Redskins in 1969 before dying during the 1970 pre-season, was the inspiration behind the helmet. Lombardi pushed for the logo, which sat inside a white circle enclosed within a burgundy circle border, with Indian feathers hanging down from the side, because of its similarity to the "G" on the helmets worn by his Green Bay Packers for many years. 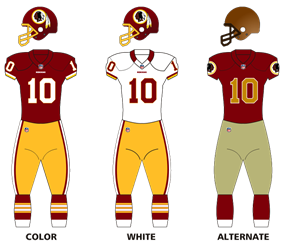 On September 14, 2008, Week 2 and game two for the team of the 2008 season, the Redskins again donned the white-on-white look, which was reminiscent of the successful stretch at the end of the 2005 season. On November 3, 2008, the Redskins wore burgundy jerseys over their burgundy pants in a Monday night home game against the Pittsburgh Steelers the night before the 2008 U.S. Presidential election. The Redskins lost the game, 23–6. It was the first time the Redskins went with the dark "monochrome" look that many NFL teams have adopted in some form over the past few years. This uniform combination made a reappearance in 2009 against the Dallas Cowboys at Cowboys Stadium on November 22 and a home Monday night game against the New York Giants on December 21. American football teams in Washington, D.C.
‡Posted best regular-season NFC record (no divisions that season due to NFL Player's Strike). Thomas G. Smith, Showdown: JFK and the Integration of the Washington Redskins. Boston, MA: Beacon Press, 2011. ^ a b c d "Washington Redskins History". ^ "Super Bowl Standings". NFL.com. Retrieved 2014-09-28. ^ a b "Washington Redskins Championship History". NFLTeamHistory.com. Retrieved April 5, 2008. ^ Badenhausen, Kurt (July 15, 2013). "Real Madrid Tops The World's Most Valuable Sports Teams". Forbes. ^ "536-538-Paid Attendance.pdf". Official 2013 National Football League Record and Fact Book. NFL.com. ^ "Team » Washington Redskins". ProFootballHOF.com. 1937-09-16. Retrieved 2012-09-03. ^ "Largest existing survey shows 19% support a name change for the Washington Redskins". Survata. October 21, 2013. Retrieved December 10, 2013. ^ "'"Patent Office: Redskins 'disparaging. ESPN.com. ^ a b "USPTO TTABVUE. Proceeding Number 92046185". United States Patent and Trademark Office. June 18, 2014. Retrieved June 18, 2014. ^ Marino, Christopher J. (20 June 2014). "Redskins Trademark Registrations Cancelled Again. It Has Been A Tough Week For "Poor" Daniel Snyder and His Washington Redskins". The National Law Review (Giordano, Halleran & Ciesla, P.C.). Retrieved 31 July 2014. ^ Richman, Michael (2008).The Redskins Encyclopedia, 3, Temple University Press, Philadelphia, PA.
^ "Third Stadium a Real Charm". The Washington Post. July 24, 1998. Retrieved April 5, 2008. ^ a b c "Washington Redskins History: 1930". Washington Redskins. Retrieved December 13, 2009. ^ a b c d e f g h i j k l m n o p q r s "Washington Redskins playoff history". ^ "Turk Edwards Hall of Fame biography". ^ Nash, Bruce, and Allen Zullo (1986). The Football Hall of Shame, 68–69, Pocket Books. ISBN 0-671-74551-4. ^ a b c d e f g h i j k l m n o p q "Washington Redskins' History". ^ "Washington Redskins Team History". NFLTeamHistory.com. Retrieved April 6, 2008. ^ a b c "Washington Redskins History: 1950". Washington Redskins. Retrieved December 13, 2009. ^ "NFL Coach of the Year Award". Hickok Sports. Retrieved April 6, 2008. ^ a b "Washington Redskins History: 1960". Washington Redskins. Retrieved December 13, 2009. ^ "Bill McPeak, Football Scout, 64". The New York Times. May 9, 1991. Retrieved April 6, 2008. ^ Hack, Damon (October 27, 2002). "Pro Football: Inside The NFL; A Greatest Redskin Still Loves New York". The New York Times. Retrieved April 5, 2008. ^ a b "A Look At The Four Redskins Owners". ^ a b "Vince Lombardi Biography". Vince Lombardi Official Website. Archived from the original on March 13, 2008. Retrieved April 5, 2008. ^ "Lecture: Lynn Povich and George Solomon". ^ a b c d e f "Civil Rights on the Gridiron". ^ a b c d "Washington Redskins History: 1970". Washington Redskins. Retrieved December 13, 2009. ^ "His past molds Bucs' future". ^ a b c d e f g h i j "Washington Redskins History: 1980". Washington Redskins. Retrieved December 13, 2009. ^ "Magic '70 Chip' Ends Four Decades of Trying". The Washington Post. July 27, 1996. Retrieved April 5, 2008. ^ "1983 Washington Redskins". Pro Football Reference. Retrieved April 5, 2008. ^ "Gibbs' first job is to tame Snyder". USA Today. January 7, 2004. Retrieved April 5, 2008. ^ a b "Williams Delivers a Super Bowl Triumph". The Washington Post. July 23, 1998. Retrieved April 5, 2008. ^ a b c d e f g h i j k l m n o "Washington Redskins History: 1990". Washington Redskins. Retrieved December 13, 2009. ^ "Profile and History". Joe Gibbs Racing. Archived from the original on March 8, 2008. Retrieved April 5, 2008. ^ "1998 Washington Redskins". Football @ JT-SW. Retrieved April 8, 2008. ^ Sandomir, Richard (April 27, 1999). "Redskins Are Sold For $800 Million". The New York Times. Retrieved April 5, 2008. ^ "1999 Washington Redskins". Football @ JT-SW. Retrieved April 8, 2008. ^ a b c d e f g h i "Washington Redskins History: 2000". Washington Redskins. Retrieved December 13, 2009. ^ "2000 Washington Redskins". Football @ JT-SW. Retrieved April 8, 2008. ^ a b "DC Sports Bog". The Washington Post. ^ "Gibbs' deal more lucrative than Spurrier's". ESPN. Retrieved December 27, 2007. ^ Bell, Jarrett; Wood, Skip; Mihoces, Gary; Leinwand, Donna (November 28, 2007). "Death of Redskins' Sean Taylor stuns team, NFL". USA Today. Retrieved May 27, 2010. ^ NFL.com Blogs "Shanahan will receive five-year deal to coach Redskins". Retrieved January 4, 2010. ^ Lindsay Czarniak. "Haslett Happy at Helm of Redskins' Defense". ^ Maese, Rick; Reid, Jason (March 5, 2010). "Washington Redskins cut 10 off of roster ahead of free agency period". The Washington Post. ^ "Redskins Beat Cowboys as Holding Penalty by Barron Ends Game". The New York Times. Associated Press. September 13, 2010. ^ Tinsman, Brian. "Kicker Loving The New Practice Bubble". The Redskins Blog. Retrieved February 1, 2012. ^ Mark Maske (March 12, 2012). "Redskins to lose $36 million in cap space over two years". The Washington Post. Retrieved March 27, 2012. ^ Watkins, Calvin (March 26, 2012). "Redskins, Cowboys file grievance". ESPN. Retrieved March 27, 2012. ^ Campbell, Rich (May 22, 2012). "Arbitrator dismisses Redskins salary cap grievance". WashingtonTimes.com. Retrieved 2012-05-27. ^ Jones, Mike (October 22, 2012). "Chris Cooley passes physical, officially back with Redskins". Washington Post. Retrieved December 10, 2012. ^ Whyno, Stephen (December 3, 2012). "Monday Night Football: Alfred Morris hits 1,000 yards rushing". Washington Times. ^ Barnard, Bob. "DC and Prince George's County Each Pushing for Redskins to Move Headquarters from Ashburn". Fox 5 News. Retrieved February 1, 2012. ^ Vozzella, Laura (June 19, 2012). "Virginia legislators accuse Gov. McDonnell of doing 'end run' on Washington Redskins deal". Washington Post. Retrieved June 18, 2012. ^ Maske, Mark (December 22, 2013). "Pierre Garcon breaks Art Monk’s Redskins record for catches in a season". Washington Post. Retrieved February 12, 2014. ^ Pelissero, Tom (December 30, 2013). "Reskins Fire Coach Mike Shanahan". USA Today. Retrieved December 30, 2013. ^ Maske, Mark (January 9, 2014). "Jay Gruden hired as Redskins coach". Washington Post. ^ "Washington Redskins New Uniforms". ESPN Page 2. Retrieved August 27, 2010. ^ "Redskins wearing gold pants". Washington Post. September 12, 2010. ^ "Washington Redskins' alternate unis revealed". ^ Chase, Chris. "New NFL rule ruins Redskins' iconic throwback uniforms". USA Today. Retrieved 2 March 2014. ^ Steinberg, Dan. "Redskins removing burgundy collars from white jerseys". Washington Post. Retrieved 2 March 2014. ^ The American Heritage® Dictionary of the English Language, Fifth Edition. Houghton Mifflin Harcourt Publishing Company. 2011. Retrieved November 7, 2014. n. Offensive Slang Used as a disparaging term for a Native American. ^ "Redskin". Dictionary.com. Retrieved November 7, 2014. noun, Slang: Often Disparaging and Offensive. 1. a North American Indian. ^ "definition of redskin". RANDOM HOUSE KERNERMAN WEBSTER'S College Dictionary. Retrieved November 7, 2014. ^ "Definition of redskin". Collins English Dictionary. ^ J Gordon Hylton (2010-01-01). "BEFORE THE REDSKINS WERE THE REDSKINS: THE USE OF NATIVE AMERICAN TEAM NAMES IN THE FORMATIVE ERA OF AMERICAN SPORTS, 1857-1933" 86. North Dakota law review. p. 879. ^ "Anti-Defamation and Mascots". National Congress of American Indians. Retrieved 12 January 2013. ^ "NCAI Releases Report on History and Legacy of Washington's Harmful "Indian" Sports Mascot". Retrieved October 11, 2013. ^ Pro-Football, Inc. v. Harjo, 415 F.3d 44 (2005). ^ "United States Patent and Trademark Office". Retrieved October 16, 2013. ^ Erik Brady (May 10, 2013). "New generation of Native Americans challenges Redskins". USA Today. Retrieved May 10, 2013. ^ Ryan Van Bibber (June 19, 2014). "12 questions (and answers) that explain the 'Redskins' trademark case". SBNation. ^ "Statement By Bob Raskopf, Trademark Attorney For The Washington Redskins" (PDF). June 18, 2014. ^ "Meet the Navajo Activist Who Got the Washington Redskins’ Trademark Revoked: Amanda Blackhorse". Democracy Now! accessdate=June 19, 2014. June 19, 2014. ^ "Statement by Bob Raskopf Trademark Attorney for the Washington Redskins". Redskins.com. ^ Erik Brady; Megan Finnerty (August 14, 2014). "Washington Redskins appeal decision to cancel trademark". USA TODAY Sports. ^ Ian Shapira (September 22, 2014). "Native Americans seek dismissal of Redskins lawsuit against them in trademark case". The Washington Post. ^ Lindsey Adler (June 18, 2014). "60 Years Of Shocking Redskins Headlines:A sampling of violent wordplay.". BuzzFeed. ^ Geoffrey Nunberg (June 23, 2014). "When Slang Becomes a Slur". The Atlantic Monthly. ^ Michelle Boorstein (October 9, 2013). "Letter from Washington Redskins owner Dan Snyder to fans". The Washington Post. ^ D. Anthony Tyeeme Clark (2005). "Indigenous Voice and Vision as Commodity in a Mass-Consumption Society: The Colonial Politics of Public Opinion Polling". American Indian Quarterly (University of Nebraska Press) 29 (1/2 (Winter - Spring)): 228–238. ^ "3rd Annual NFL Poll". Public Policy Polling. January 2, 2014. ^ "Poll: Americans Don't Want Name Change". January 2, 2014. ^ Erik Brady (January 3, 2014). "Oneida Indian Nation disputes phrasing in Redskins poll". USA TODAY Sports. ^ Mike Florio (January 2, 2014). "Redskins tout new poll that actually shows increasing support for name change". NBC Sports. ^ Dennis Junius; Ralph D. Russo (January 25, 2014). "AP-GfK Poll: 49 percent are pro football fans". AP News. Archived from the original on June 2, 2014. Retrieved September 27, 2014. ^ "The Cowboys-Redskins rivalry redefines the term ‘fight song’". ^ a b c d "A rivalry for a song ... and chicken feed". ^ Woods, Shemar (July 29, 2011). "O.J. Atogwe switches to No. 20 out of respect for Sean Taylor". Washington Post. ^ a b "Theismann's No. 7 taken out of circulation again". USA Today. May 13, 2002. Retrieved February 19, 2008. ^ Deeply Hurt,' Mitchell Retires; Redskins Great Felt Slighted by Team."'". Washington Post. ^ "Redskins Ring of Fame". Retrieved October 23, 2009. ^ "Mitchell to Be Inducted into Ring of Fame". Retrieved October 23, 2009. ^ "Super Bowl History". Nfl.com. Retrieved 2012-09-03. ^ "Mark May's Career Statistics". NFL. Retrieved April 2, 2008. ^ a b c d "History: 70 Greatest Redskins". Washington Redskins. Archived from the original on October 14, 2007. Retrieved April 7, 2008. ^ Tinsman, Brian (August 24, 2012). "Ten Newest Greatest Redskins Announced". Redskins.com. Retrieved 2012-08-24. ^ a b c d e f g "Team-by-team single-season records – Names and Numbers". Football Digest. 2002. Retrieved January 12, 2008. ^ "Moss, Portis Set New Franchise Marks". Washington Redskins Website. Retrieved December 29, 2007. ^ a b "Washington Redskins Kick & Punt Returns Single-Season Register". Pro Football Reference. Retrieved December 28, 2010. ^ "Oldest Individual Single-Season and Single-Game Records". Professional Football Hall of Fame. Retrieved December 29, 2007. ^ a b c d "Washington Redskins: Firsts, Records, Odds & Ends". ^ a b c "History : Career Stats Leaders". Washington Redskins Official Website. Archived from the original on October 12, 2007. Retrieved December 27, 2007. ^ a b "Washington Redskins Kick & Punt Returns Career Register". Pro Football Reference. Retrieved December 28, 2010. ^ a b "Helu, Gano Set New Franchise Marks". redskins.com. 2011. Retrieved November 7, 2011. ^ "Team Records: Games Won". National Football League. Retrieved January 2, 2008. ^ a b c "Team Records: Scoring". National Football League. Retrieved January 2, 2008. ^ "Team Records: Touchdowns". National Football League. Retrieved January 2, 2008. ^ "Team Records: Points After Touchdown". National Football League. Retrieved January 2, 2008. ^ "Team Records: First Downs". National Football League. Retrieved January 2, 2008. ^ a b c d "Team Records: Passing". National Football League. Retrieved January 2, 2008. ^ "Team Records: Fumbles". National Football League. Retrieved January 12, 2008. ^ "Defense Records: First Downs". National Football League. Retrieved January 12, 2008. ^ a b "Defense Records: Net Yards Allowed". National Football League. Retrieved January 12, 2008. ^ "Defense Records: Passing". National Football League. Retrieved January 12, 2008. ^ "Defense Records: Turnovers". National Football League. Retrieved January 12, 2008. ^ "Defense Records: Turnovers". National Football League. Retrieved July 16, 2008. ^ a b c "Team Records: Field goals". National Football League. Retrieved January 2, 2008. ^ a b "Team Records: Punting". National Football League. Retrieved January 12, 2008. ^ "Team Records: Kickoff returns". National Football League. Retrieved January 12, 2008. ^ Farhi, Paul (July 17, 2008). "Snyder's Simulcast Plans Center on WTEM". Washington Post. Retrieved July 17, 2008. ^ "Larry Michael: D.C.'s most versatile voice". GW Hatchet. Retrieved December 27, 2007. ^ a b "WJFK replaces Herzog; L. Michael joins Jurgensen, Huff". Washington Times. Retrieved December 27, 2007. ^ Carroll, Chuck. 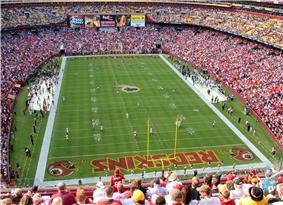 "Report: Redskins New Stadium Talks Include Dome at RFK Site". Washington Post. Retrieved 28 August 2014. ^ CNN McCain gets bad sign? November 4, 2008. ^ Huffington Post  November 4, 2012. ^ The China Post 'Redskins Rule' could predict election winner, Updated Saturday, November 1, 2008, 10:46 am TWN, AFP. ^ The Orlando Sentinel "Did Washington Redskins' loss to Pittsburgh Steelers clinch the Presidential election for Barack Obama over John McCain? ", November 4, 2008. The Redskins Rule was discovered by Steve Hirdt, executive vice president of the Elias Sports Bureau, while searching for discussion fodder in 2000 for a game between the Redskins and Titans. For 17 of the past 19 United States Green Bay Packers beating the Redskins, and again in 2012, when Barack Obama retained the presidency on November 6, despite the Redskins losing to the Carolina Panthers on November 4, 21–13. Other than these exceptions, this "Redskins Rule" has proven true since 1936 when they won and incumbent Franklin D. Roosevelt won re-election, prior to the Redskins' move from Boston in 1937. In August 2014, team owner Daniel Snyder made public his desire of getting the team a new stadium, which would eventually replace FedEx Field, the home for the team for nearly 20 seasons. While the location has yet to be decided, Snyder indicated the possibility of building a domed stadium at the site of the old RFK Stadium in the district itself, but also stated that other sites in Maryland and Virginia were a possibility as well. Early plans have included making the stadium and fan experience more nostalgic, akin to the days at RFK Stadium, where the team spent over 30 years. Snyder also stated his desire for the area to host a Super Bowl as a contributing factor behind his push for a new stadium. Prior to the Carolina Panthers inaugural season in 1995, most residents of North Carolina were Washington Redskin fans. A handful of North Carolinian's still are, particularly in the northeastern part of the state. The closer to the Interstate 26 corridor was either neutral or Atlanta Falcons. Therefore prior to 1995, the Washington Redskins were often on television but not mandated by the NFL. A Triangle Redskins Fan club still exists in Raleigh as of 2011. The Redskins haven't been blacked out at home since 1972, a year before local telecasts of sold-out home games were allowed, although the Redskins have often had to deal with no-shows (but not in recent years). Only three other NFL teams have had sellout streaks dating to before 1973. In the regular season, most games are shown locally on Fox O&O WTTG per the NFC contract with the Fox Broadcasting Company. The main exceptions are when the Redskins host an AFC team or play at night. Kenny Albert does play-by-play, former Redskins quarterback Joe Theismann is the color analyst, and Rick "Doc" Walker is the sideline reporter. Telecasts of preseason games not shown on national networks are aired in HD exclusively on Comcast SportsNet in the overall Mid-Atlantic region. 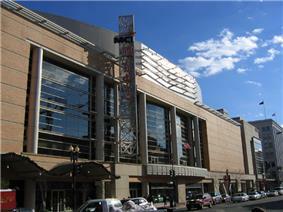 WRC-TV broadcasts preseason games in SD in the Washington, D.C. area. Comcast SportsNet also airs a pregame show and an extensive game recap program after each Redskins regular season Sunday game. Another former Washington tight end, Rick "Doc" Walker, is the sideline reporter and Kevin Sheehan hosts the team's pregame show. Longtime Redskins running back/receiver/return man Brian Mitchell also contributes to broadcasts. Michael is joined by analysts Sonny Jurgensen and Chris Cooley. Jurgensen is a former Redskins quarterback who has been in broadcasting since he retired from the team in 1974, much of that time spent working for his former team. 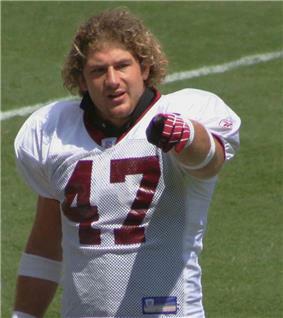 Cooley played fullback and tight end for the Redskins from 2004 until 2012 and made the Pro Bowl twice. Cooley replaced Sam Huff, the former Hall of Fame linebacker who played several years with the Redskins, as color commentator following Huff's retirement at the end of the 2012 season. As of the 2013 season, Larry Michael is the voice of the Redskins on the radio. He took this role in 2004 after longtime announcer Frank Herzog left. As of 2008, the Redskins' flagship station is WTEM (ESPN 980), owned by Red Zebra Broadcasting, which in turn is owned by Snyder. The Redskins led the league in field goals for eight seasons, 1945, 1956, 1971, 1976–77, 1979, 1982, 1992. Only the Green Bay Packers have ever led more. Their 49 field goals attempted in 1971 is the most ever attempted in a single season. Broken by David Akers (49ers) 2011 Season. The Redskins have led the league in punting average six times, in 1940–43, 1945, and 1958, second only to the Denver Broncos. Their four consecutive years from 1940–43 is an NFL record. The Redskins have led the league in average kickoff return yards eight times, in 1942, 1947, 1962–63, 1973–74, 1981, and 1995, more than any other team. The Redskins all time FG record is 59yds (4 shy of tying the all time NFL Record). It was set 11–06–11 by Graham Gano against the San Francisco 49ers at FedexField. The Redskins recovered eight opponent's fumbles against the St. Louis Cardinals on October 25, 1976, the most ever in one game. The Redskins allowed 82 first downs in 1937, third fewest all-time. The Redskins have led the league in fewest total yards allowed five times, 1935–37, 1939, and 1946, which is the third most. Their three consecutive years from 1935–37 is an NFL record. The Redskins have led the league in fewest passing yards allowed seven times, in 1939, 1942, 1945, 1952–53, 1980, and 1985, second only to Green Bay (10). The Redskins had 61 defensive turnovers in 1983, the third most all-time. The turnover differential of +43 that year was the highest of all time. The Washington Redskins have had two 14-win seasons, in 1983 and 1991. This is sixth place all-time. The Redskins scored 541 points in 1983, which is fourth most all time after being surpassed by the 1998 Minnesota Vikings, the 2007 New England Patriots, and most recently by the 2013 Denver Broncos. The Redskins' 72 points against the New York Giants on November 27, 1966, are the most points ever scored by an NFL team in a regular season game, and the 72 to 41 score amounted to 113 points and the highest-scoring game ever in NFL history. The second-half scoring for the game amounted to 65 points, the second-highest point total for second-half scoring and the third-highest total scoring in any half in NFL history. The Redskins' ten touchdowns are the most by a team in a single game, and the 16 total touchdowns are the most combined for a game. The Redskins' nine PATs are the second most all-time for a single game, and the 14 combined PATs are the most ever in a game. The Redskins set a record for most first downs in a game with 39 in a game against Detroit on November 4, 1990. They also set a record by not allowing a single first down against the Giants on September 27, 1942. The Redskins have led the league in passing eight times: in 1938, 1940, 1944, 1947–48, 1967, 1974 and 1989. Only the San Diego Chargers have led more times. The Redskins led the league in completion percentage 11 times: in 1937, 1939–1940, 1942–45, 1947–48 and 1969–1970, second only to the San Francisco 49ers. Their four straight years from 1942–45 is the second longest streak. The Redskins' nine sacks allowed in 1991 are the third fewest allowed in a season. The Redskins completed 43 passes in an overtime win against Detroit on November 4, 1990, second most all-time. The Redskins have sold out every home game since 1958. On the Redskins' 80th anniversary, August 24, 2012, ten more people were added to the list of the Greatest Redskins of All-Time. The panel that chose the 70 consisted of former news anchor Andy Pollin; NFL Films president Steven Sabol; and news anchor Jim Vance. In honor of the Redskins' 70th anniversary, on June 13, 2002, a panel selected the 70 Greatest Redskins to honor the players and coaches who were significant on-field contributors to the Redskins five championships and rich history. They were honored in a weekend of festivities, including a special halftime ceremony during the Redskins' 26–21 win over the Indianapolis Colts. 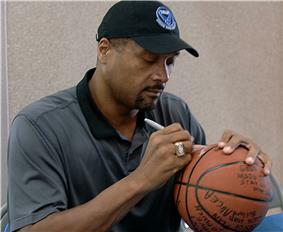 Mark May, offensive lineman for the Redskins between 1981 and 1989, was named one of the 70 Greatest Redskins. The Redskins have played in five Super Bowls, going 3–2 during that span. They have faced the Miami Dolphins twice, splitting the series. They have also played the Los Angeles Raiders, the Denver Broncos and the Buffalo Bills. Three Redskins players have been named MVP of the Super Bowl. The use of unofficial retired numbers drew controversy during Steve Spurrier's first year as head coach. Quarterbacks Danny Wuerffel and Shane Matthews first wore 7 and 9 respectively during training camp. The resulting sports talk furor led to them switching to 17 and 6. During the season, reserve tight end Leonard Stephens wore number 49 for the season. After his retirement as assistant GM, Bobby Mitchell blasted the team, for not being considered for GM and was upset that the team would let a player like Leonard Stephens wear his number. Sean Taylor's number 21 has not been reissued since his death during the 2007 season, but it is unknown, as of 2011, whether the number should be considered "unofficially retired." A Google search reveals multiple fan petitions seeking to have the number formally retired. Free agent signing O.J. Atogwe, who had "worn No. 21 his entire life", chose to switch to No. 20 out of respect for Taylor. The Redskins' policy since Baugh's retirement has been to not retire numbers. However, some numbers are unofficially retired and are usually withheld from being selectable by new players. The following numbers of past Redskins greats fall into that category. The Cowboys–Redskins rivalry is a sports rivalry between two professional American football teams in the NFL that have won 31 combined division titles and ten Championships, including eight combined Super Bowls. The rivalry started in 1960 when the Cowboys joined the league as an expansion team. During that year they were in separate conferences, but played once during the season. In 1961, Dallas was placed in the same division as the Redskins, and from that point on, they have played each other twice during every regular season. The team continues to cite polls showing general public opinion in opposition to changing the name. One poll was part the 2014 poll of issues regarding the NFL, which included one question indicating 71% of the general public are in favor of keeping the name, with 18% in favor of a change. On their website the team states: “This poll, along with the poll taken among Native Americans by the Annenberg Institute, demonstrates continued, widespread and deep opposition to the Redskins changing our name. The results of this poll are solidly in line with the message we have heard from fans and Native Americans for months – our name represents a tradition, passion and heritage that honors Native Americans. We respect the point of view of the small number of people who seek a name change, but it is important to recognize very few people agree with the case they are making.” The Onieda Indian Nation "believes more Americans would favor changing the team name of the Washington NFL club if they understood the full context of what the Oneidas and others consider a racial slur." Mike Florio points out that since an AP poll taken in April 2013 showed 79% in favor of keeping the name; the 71% result in the new poll is a significant decrease in support in a short time. A 2014 AP-Gfk Poll however, showed 83% support keeping the name. In response to the continued controversy, the team owner Dan Snyder sent an open letter to fans that was published in The Washington Post on October 9, 2013. In the letter Snyder states that the most important meaning of the name Redskins is the association that fans have to memories of their personal history with the team. Snyder also states that the name was chosen in 1933 to honor Native Americans in general and the coach and four players at that time who were Native American; and that in 1971 the then coach George Allen consulted with the Red Cloud Indian Fund on the Pine Ridge reservation when designing the logo. Supporters also assert that a majority of Native Americans themselves are not offended, based upon a public opinion poll in 2004 in which 90% of those who identified as American Indians answered that they were "not bothered" by the name "Redskins" being used for the Washington football team. However in a commentary published soon after that poll, fifteen Native American scholars collaborated on a critique that stated that there were so many flaws in the Annenberg study that rather than being a measure of Native American opinion, it was an expression of white privilege and colonialism. Evidence of disparagement submitted by the petitioners in the TTAB case include the frequent references to "scalping" made by sportswriters for sixty years when reporting the Redskins loss of a game, and passages from movies made from the 1940s to the 1960s using "redskin" to refer to Native Americans as a savage enemy. A linguistics expert for the team unsuccessfully argued that the name is merely a descriptive term no different than other uses of color to differentiate people by race. The linguistic expert for the petitioners, Dr. Geoffrey Nunberg, argued that whatever its origins, "redskins" was a slur at the time of the trademarks, based upon the passages from books and newspapers and the movie clips in which the word is inevitably associated with contempt, derision, condescension, or sentimental paeans to the noble savage. Bob Raskopf, the Redskins trademark attorney, released a statement saying they plan to appeal the ruling. Raskopf claims the Trademark and Patent office lacked substantial evidence to back their claim that the Redskins name was disparaging to Native Americans, as well as the tribes petitioning for the name change. He also claimed that while the appeal process is going on, the trademark will remain valid. The Washington Redskins filed its appeal of the case on August 14, 2014; stating their belief "that the Trademark Trial and Appeal Board (TTAB) ignored both federal case law and the weight of the evidence". They also cite infringement of their First Amendment right to free expression. On September 22, 2014 the Native Americans asked that the team's appeal be dismissed because it names them as individuals, which is contrary to federal law, and because the appeal was filed with the U.S. District Court in Alexandria, VA; stating that the Redskins should have filed its case against the patent office in the U.S. Court of Appeals for the Federal Circuit in Washington, DC. In 1992, a group of American Indians led by Suzan Harjo filed Harjo et al v. Pro Football, Inc. to have the United States trademarks associated with the Redskins name canceled under statutes which prevent registration of disparaging terms. The Trademark Trial and Appeal Board (TTAB) in 1999 ruled in favor of the petition and canceled the trademarks. Following appeals, in 2005, the D.C. Court of Appeals in Pro-Football, Inc. v. Harjo reversed the cancellation, ruling that there was insufficient evidence to support the finding of disparagement and holding that the majority of the petitioners were barred by laches from maintaining the suit. A second case was filed, Blackhorse v. Pro-Football, Inc., with younger plaintiffs whose standing might not be hindered by laches. On June 18, 2014, the TTAB again voted to cancel the six trademarks held by the team in a two to one decision that held that the term "redskins" is disparaging to a "substantial composite of Native Americans", and this is demonstrated "by the near complete drop-off in usage of 'redskins' as a reference to Native Americans beginning in the 1960s." The TTAB majority held that the NCAI represented about 30 percent of Native Americans during the time in question, which the Board found satisfied the substantial composite test. In a press release the trademark attorney for the team stated that they were confident that they would once again prevail on appeal, and that today's decision will make no difference in the continued use of the Redskins name. Plaintiff Amanda Blackhorse, a social worker and member of the Navajo Nation, said in an interview, "We’ve been through this process for eight years now. We will continue to fight. And, you know, this is not the end for us." Native American individuals, tribes and organizations have been questioning the use of the name and image for decades. In the 1940s the National Congress of American Indians (NCAI) created a campaign to eliminate negative stereotyping of Native American people in the media. Over time, the campaign began to focus on Indian names and mascots in sports. The NCAI maintains that teams with mascots such as the Braves and the Redskins perpetuate negative stereotypes of Native American people, and demean their native traditions and rituals. The NCAI issued a new report in 2013 summarizing opposition to Indian mascots and team names generally, and the Washington Redskins in particular. The name and logo of the Washington Redskins is part of a larger controversy regarding the use of Native American names, images and symbols by non-native sports teams, but receives the most public attention due to the prominence of the team being located in the nation's capital and the name itself being defined in current dictionaries of American English as "usually offensive", "disparaging", "insulting", and "taboo". In 2012, the team would wear an updated throwback uniform of the 1937 team in a loss versus the Carolina Panthers on November 4, in honor of Sammy Baugh's rookie season, and the team's championship season. Although a recent NFL rule implemented in 2013 that states teams may not wear alternate helmets on account of player safety, the Redskins would again wear the 1937 throwbacks with the sticker removed from the regular helmet in an overtime win versus the San Diego Chargers on November 3. That year would also see the team remove its burgundy collar from their white jersey, in order to have better consistency with the new Nike uniforms that debuted the previous season. In 2011, they would wear the burgundy jersey/gold pants look for five home games and a road game at Dallas, the burgundy jersey/white pants look for three home games and a road game at Miami, the white jersey/burgundy pants look for five road games, and the white jersey/gold pants look for a Bills "home" game in Toronto.